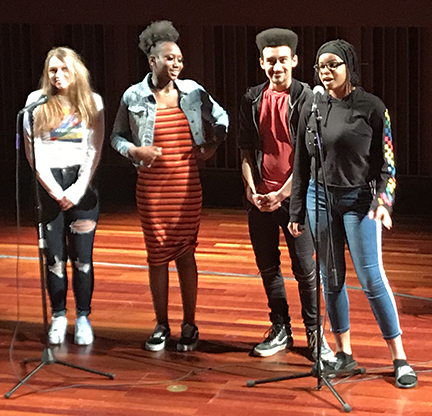 With powerful, authentic voices DePaul Cristo Rey’s student poets took the stage and audience by storm in the 2019 Louder Than A Bomb (LTAB) Cincy Finals. Senior Iyanna B. ’19 finished in first place, tied with two others, in the individual competition and the DPCR team took second place in the team finals. The LTAB poetry slam finals took place on Friday, April 5 and Saturday, April 6 at the National Underground Railroad Freedom Center. Student poets represented high schools and arts organizations from around the city. DPCR’s Voice at Work club gives students the opportunity to write and perform poetry individually or as a group as they prepare for the LTAB competition. Louder Than A Bomb is a nationwide youth poetry slam that originated in Chicago as a festival for young spoken word artists of diverse cultural backgrounds. Pictured during Saturday’s night performance are team members (left to right): Charissa M. ’21, Iyanna B. ’19, Kai D. ’19, and Chaukiyan B. ’19. Not pictured are team members Shannon D. ’19, Daniel G. 19, Jaelyn T. ’19, and Team Manager Justin M. ’20. The team is coached by English teachers Pat Brennan and Manuel Iris.